MarcieMom saw on twitter that Silver Sense is active in eczema community and events and connected with Sarah Davies, co-founder of Silver Sense. Silver Sense is a company based in Nottinghamshire, UK, that creates children clothing made from a blend of natural cotton and silver fibres. Silver Sense’s clothing comes in a family of animals, and MarcieMom interviews Sarah to find out more about Albert the Whale, Gilbert the Gecko, Jeffrey the Monkey, Sidney the Spider, Jude the Crocodile, Olivia the Duckling and Erica the Elephant! Marcie Mom: Thank you Sarah for taking time for this interview. I’d have to commend you that indeed the clothing looks gorgeous! I read from your site that Silver Sense is set up by your brother, Richard Lamb and you. While his work experience is in medical textiles, yours is in fashion design and product development. Both of you started Silver Sense because you were looking for a solution for your son Jonathan’s eczema. Could you share a little about your journey? For instance, how severe was Jonathan’s eczema? And for how long did you try other treatments before you decided to create Silver Sense? And what other skincare regimen and treatment (if any) do you use even after Jonathan is wearing Silver Sense? Sarah: Jonathan’s eczema started at approximately 4 months old, to begin with it was quite mild so we tried to treat it solely with emollients which had been suggested by other Mums however we didn’t find anything that offered much improvement. We made changes to our daily routine such as stopping using fabric softeners and just bathing him in water. We found that some of the creams we tried actually made things worse as he had allergic reactions to some of the ingredients. His eczema wasn’t clearing and was in fact spreading to other areas so we made the first of our trips to the doctor. Our doctor was very understanding and assured us it was ‘just’ baby eczema so armed with more creams and washes we tried again to treat it. Again, the washing cream made it worse and the prescription lotions did nothing, including the very mild steroid cream. By now the patches were infected and would bleed, Jonathan would also try to scratch them whenever he could. He had eczema on his tummy, tops of his arms, shoulders, back of his neck, cheeks and the backs of his knees, these patches were crusty and bleeding. It was very distressing for all of us. We went back to the Doctor and were given a stronger steroid cream which we could only use very sparingly and not on his face, it was horrible to see him scratch his cheek until it was bleeding and I couldn’t find anything to help improve this. The stronger steroid cream did offer some improvement but I hated using it on him and found that when I stopped the eczema just returned to how it was. It was at this stage when I learnt more about the healing properties of Silver and was desperate to find a long term solution that Silver Sense was born. Jonathan now sleeps on Silver Sense bedding which has cleared up the patches on his cheek and neck. He also sleeps in our jammies and wears a vest every day. In conjunction with his Silver Sense clothing we moisturise him with Doublebase gel, use Oilatum bath additive and on any particularly dry patches we use Lucas Papaw Ointment. We find that we have no further patches on his torso, arms or face, everywhere that is in contact with the silver. He still gets eczema starting to appear on the backs of his knees towards the end of the day as they are not in contact with Silver in his other clothes however his sleepwear prevents scratching in the night and has dramatically improved his skin again by the morning.I do wonder how bad this would be without his Silver Sense clothing? Since using Silver Sense we have had no infected eczema patches. 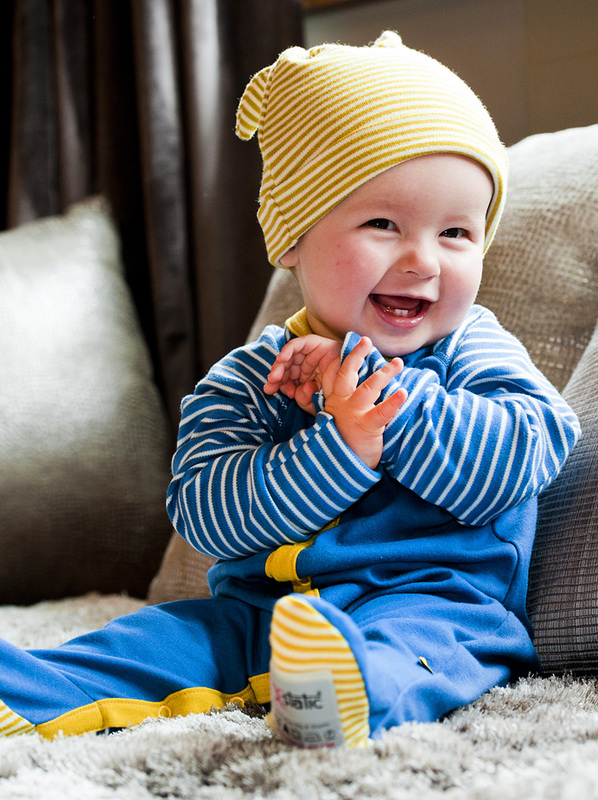 Marcie Mom: Your range of clothing is very colourful and stylish, featuring babygrows, tops, bottoms, hats, bibs and blankets, all carefully designed to have the seams and labels on the outside. Do all these products have the same amount of silver fibres in the fabric? And of what percentage of the (end) fabric has the 99.9% pure silver sourced from medical textile company X-Static? Is there a minimum % of silver required in the fabric before its anti-microbial properties can be useful? Sarah: All of our products are manufactured using fabrics that contain a minimum of 4% Pure Silver yarn; this percentage is a requirement to ensure that the products perform. All products are certified by X-Staticto ensure that they contain the correct amount of Pure Silver. MarcieMom: It is mentioned in your site that silver has been ‘clinically proven to prevent inflammation by naturally calming itchiness..’. How does silver do that? Sarah: Pure silver kills bugs by breaking down the DNA of bacteria, it is this bacteria that causes the inflammation, itchiness and infection in skin conditions. Bacteria cannot become resistant to the silver ions in our products so continual treatment is provided. The clinical studies that we refer to have been commissioned by X-Static and as such we use the amount of Silver as required by them, to meet their infection kill rates. Continued use will soothe, heal and protect delicate skin. Marcie Mom: I did a quick search over the internet and saw a few companies that sell silver clothing– what advice would you give to parents who want to assess which clothing brand to choose? For instance, is there a certain type/ grade of silver or certain size of silver fibre to look out for? Or should parents look out for where the silver textile comes from and where the clothing is made? Or is there a certification body that can give product quality and safety assurance to parents? Sarah: Firstly we would recommend that parents make sure that the clothing is using pure metal silver fibre instead of Nano silver which is a coating that can wash off and leech (leech is the transfer of particles from the material to the surrounding environment). We would recommend X-Static as it is accepted as being the market leader; it is not the cheapest yarn however it is the best in terms of performance and durability. We choose to make our products in the UK as it is where we are based and ensures we have complete control and visibility at all times of our production. Unfortunately there is no certification body however this is something we would welcome and actively be involved in. MarcieMom: I read on your site that Silver Sense wants to be a truly British brand; you design the clothing, source the silver textile from X-Static (US?) and the fabric is then made in UK and clothing knitted locally in Nottinghamshire. I note with interest that as opposed to certain manufacturers who spray silver on the fabric, you knit it into the fabric. This translates into a more durable product where the silver won’t be washed away. Tell us, what is the product life of Silver Sense clothing and is there any trial conducted as to how many machine washes it can withstand? Also, if the silver can be washed away, is there a chance that over long-term use (say, a mom only uses Silver Sense for her newborn all the way till 5 year old) the child’s skin will be exposed to excessive silver that has leeched onto the skin? Is there any research done in this area? And what is the side effect (if any) on having silver on the skin all the time? Sarah: We are the only childrenswear brand to knit pure metal silver fibre into our fabrics, when developing Silver Sense we researched many techniques of production and feel very strongly that this is the best and most effective way of adding silver to garments. X-Static have provided us with study data showing fabrics knitted with X-Static are capable of withstanding over 200 commercial laundry cycles without any performance reduction, it is accepted that industrial laundering is far more aggressive than domestic washing however we stress that customers must follow our product care guidelines which include no use of fabric softener and chlorine based bleaches. Without a doubt the pure silver in Silver Sense products will last the life of the garment and will not be washed away.Silver Sense garments will not leech. There are in excess of 300,000 US military personnel that wear X-Static base layer garments on a daily basis and there have been no known adverse side effects, in fact it is quite the opposite, soldiers report that skin conditions are improved in field conditions. Marcie Mom: Thank you Sarah so much for your time and understanding where I come from when I asked these questions. My readers would know that while I don’t do any product review (nor subject Marcie to product testing), I am always open to knowing more products and asking questions that I think will help parents to assess better their options for their child with eczema. p.s. to readers of eczemablues.com, I didn’t receive any money from Silver Sense or Sarah for this interview and any advertising on eczemablues.com is donated to the eczema fund.